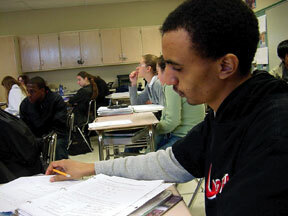 Biniam Tsegay, an ESOL student, prepares for his AP calculus AB exam in his AP class. Blair has been offering Advanced Placement (AP) courses and honors courses for a long time. Now the number of students interested in these courses is increasing, especially ESOL students and students who are not native speakers of English. AP courses are very difficult to handle for ESOL students and for Americans who were born in this native land, too. AP courses cover a lot of subjects such as calculus, chemistry, biology and a lot more. In AP classes, all the information that students learn is exactly what college students have to deal with. The courses are very fast and tough. The courses require a lot of reading, labs and a strong sense of knowledge mixed with the sense of applying concepts to real life. AP courses are for those who have potential and ability to explore what they know and to move forward with more knowledge. At the end of the year, those who are willing to earn college credit may take AP exams, which have a fee that students must pay. Most exams are about 3 hours in length. The exams cover all the lessons that students learn from first quarter up until the time they take the exam. To receive college credit, most colleges require that students achieve a score of 3 (out of 5) or higher on the grading scale. Similar to AP courses, honors courses are high-level classes. On the other hand, those taking honors courses can’t earn college credit from an exam because these honors courses are for students who wish to study deeper into a subject but do not study college material. There are many advantages for taking AP and honors courses. First of all, students get a good start on the work that they will deal with in college. Students get to improve, expand and apply knowledge that students learn in the real world. Students challenge themselves so that from those challenges they develop good learning habits that are necessary in college life. And students have more chances to be accepted into colleges than other students who have not taken any high level classes during their high school years. Each year, the number of ESOL students taking these courses has been increasing. According to Mr. Bellino who keeps data for the school, three years ago there were 237 current and former ESOL students taking 737 honors and AP courses. Today there are 361 current and former ESOL students taking 1076 courses. Most ESOL students are taking math and science courses. Not many of them are taking the classes where reading is a must or they have to write many long essays, but there are some. One of the reasons for this is because some ESOL students study high levels of math and science in their own countries. When they come here, they have already worked hard to develop good study habits. Many of them do well in their classes. “I was successful and I am now,” said Biniam Tsegay, who is taking AP Calculus AB and AP physics. To achieve success they have had to suffer by spending more time than Americans do in homework, class work and tests. “[It] takes me more than 2 hours to read then to combine everything together,” said Chinh Nguyen, an ESOL senior taking honors government. But students must not give up each time they face predicaments. However some ESOL students have difficulty in the classes. “I have a hard time because I can’t ask the teacher the things I don’t understand,” one student said. In many AP and honors courses when the majority of the students are White, ESOL students are left out because of lack of understanding or because they are too nervous to participate. “When the teacher calls my name to take attendance, I just raise my hand up and do not speak any word at all,” said Chinh Nguyen. For me personally, I have taken AP and honors courses since 2004. My main reason for taking honors courses last year was to show everyone that I was smart regardless of how well I was doing at that time. After taking honors courses, I discovered why honors classes are helpful. However I learned that adapting to the AP and honors learning environment is not easy. Sometimes I wanted to quit the class due to my lack of communication with others. I felt bored when in class; I had no friends except myself. I tried to stay away from participation each time we had a class discussion by tilting my head down all the time, but I was still listening. I didn’t do this because the questions were tough, but because I was afraid others would laugh or not pay attention because of my grammar and the way I spoke. One time I remember one guy, who later became my best friend, ask me, “Why do you take this honors class when you don’t even know how to express your ideas coherently in talking and writing?” That really hurt my feelings. One key to help me become a successful student in a class is to ignore what others tell me I can’t do. I also study hard by spending more time, give more effort than ever, and try very hard to make as many friends as possible. Even though the number of ESOL students taking AP and honors courses has been increasing, many ESOL students can’t even tell what higher level courses are. Since they do not know about them, they cannot take those challenging courses. Moreover counselors of ESOL students and many teachers don’t recommend ESOL students to take these courses because from their perspective, ESOL students would easily fail or barely do well in those classes.